Google+ finally announced the launch of Google+ Pages for brand and businesses. This announcement is made after few months of Google+ being in service. At the time of launch of Google+ many brands created Google+ profile for their businesses which were discouraged by Google+. Google+ team told at that time they are working on bringing brands on their social network and Google+ Pages is result of that. Now Businesses can promote their brand on Google+ and can reach to their customer and fans. Also users can recommend brand pages by doing a +1 and adding them to their circles. 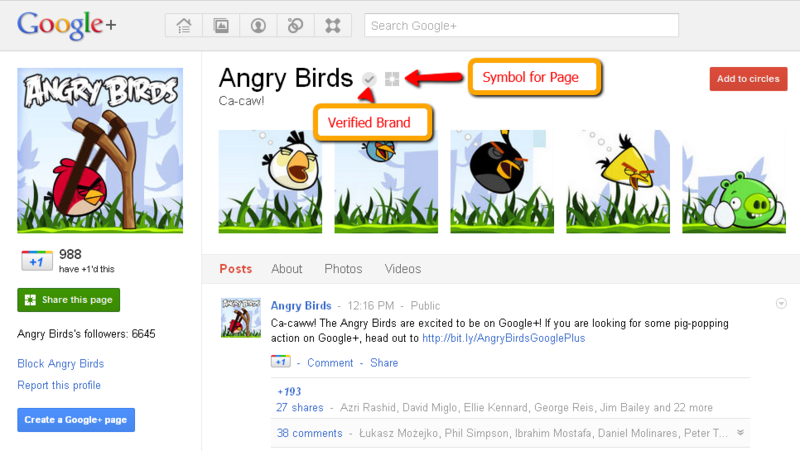 Similar to profiles, Google+ also verifies the pages for brand pages like the Angry Birds Page shown below. There are few brands which already have their pages created on Google+. Rest of the businesses will soon be able to create pages for their brands too. Small Square icon next to Page name shows that it’s a Google Page. Google used this icon to differentiate it from Google Plus Profiles. In the left hand menu of the Page, you will be able to see the count of people who have recommended that page. Any one can recommend a page by doing a +1 for that Page profile. 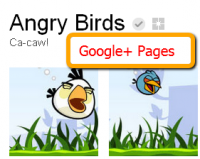 In above screenshot you’ll notice that till now Angry Birds Google+ Page has 988 recommendations and 6645 followers. You can also follow a page by just adding it to your circles by clicking ‘Add to Circles’ button on top right corner. How to create a Brand Page on Google+? Go to any other Brand Page and click on ‘Create a Google+ Page” button on the left hand side menu. This will take you to the page where you can create your desired new page. On the left hand side of your stream, you will see ‘Create a Google+ Page‘ button. Click on it, choose a category of the page and then hit Create. Your new Google+ Page will be created. As not everyone’s profile currently has option to create Google+ page, users can go this direct link to create Google+ page. Here is the link plus.google.com/pages/create. Here is the Google+ Pages launch video by Google+ team. Here is our brand new Google+ Page. Please do recommend it and Add it to your Circles.